Samantha Heather: He is Risen. This inheritance is kept in heaven for you, who through faith are shielded by God’s power until the coming of the salvation that is ready to be revealed in the last time. In all this you greatly rejoice, though now for a little while you may have had to suffer grief in all kinds of trials. These have come so that the proven genuineness of your faith—of greater worth than gold, which perishes even though refined by fire—may result in praise, glory and honour when Jesus Christ is revealed. Though you have not seen him, you love him; and even though you do not see him now, you believe in him and are filled with an inexpressible and glorious joy, for you are receiving the end result of your faith, the salvation of your souls. Happy Easter to all of you today. Enjoy this day of celebration. Christ is Risen! I think I love easter more than Christmas. I feel like it emphasizes Jesus's life more so. Love this holiday! Have a happy one! p.s. thanks so much for your last post on my blog. Yes, let's be friends! Yes, yes, yes. This makes me happy! 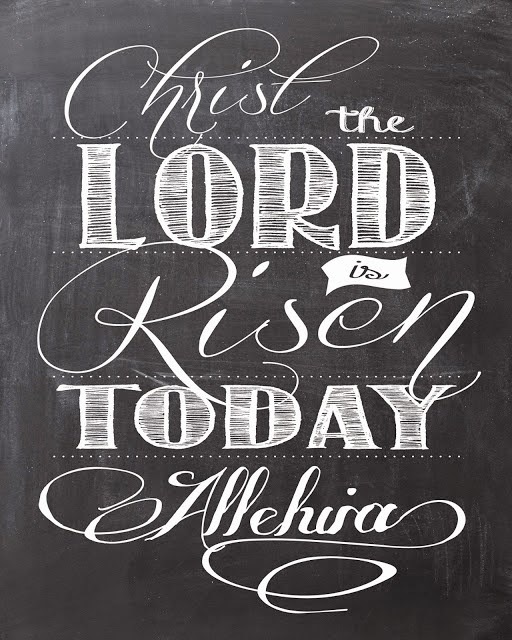 HAPPY EASTER TO YOU, praise the lord!